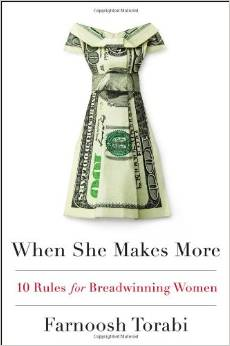 When She Earns More: How To Make It Work? In about one-quarter of all marriages in this country, the woman is the primary breadwinner and outearns her husband or partner. Needless to say, that can change the traditional family dynamics about who takes care of the kids, makes the financial decisions, and plunks down the credit card at the end of a dinner out. Women are way out in front within the Gen X and Gen Y demographic groups (roughly those born from 1980 onward). In fact, Torabi makes the point that women under the age of thirty now have higher median income, on average, than men in nearly every major city across the country. (Part of the reason for this, says Torabi, is that boys seem to mature more slowly and aren’t quite ready for prime time until later in their twenties. So note that while they may start off behind, they may not stay behind. If you have a college-age boy, like I do, you’ll probably be nodding your head in agreement!). What do the in-laws think? High-powered women breadwinners may be the new reality, but society’s not always comfortable with the concept. Admits Torabi, “we’re a bit mixed about what we think about all this.” Even women aren’t so sure what to make of it, and deep down, some feel bad outstripping their husbands in earning power, and guilty spending time away from kids. Every couple handles money and financial decision-making differently. There’s really no “right” answer, says Torabi, citing several different examples of how families can divvy up money, household chores, and financial accounts (the famous “yours,” “mine,” and “ours” division is a popular choice). The “best” way is undoubtedly one that combines a degree of financial independence with some shared decision-making, so each partner knows what’s going on and has a say. The happy family is one that shares values and priorities, so they’re all pulling in the same direction, regardless of who earns what. Couples might go through different stages and roles, so it’s important to reevaluate circumstances every few years. He may put his career on the back burner to let her advance, then they might swap so she can spend more time with teenage kids. Traditional gender stereotypes still exist, and can make it hard – on both women and men – when the woman becomes the primary breadwinner. The in-laws may not be that understanding of the man who stays home to take care of the kids, or the executive mom who can’t make it to classroom events. Both partners need to learn to value what the other contributes to the family, or the marriage will start to unravel. Household chores, and “who does what,” is still a minefield. Who can’t identify with this stereotypical scenario? She comes home exhausted after a long day of work, and finds him sitting on the couch relaxing and watching the sports highlights. When he yells out “Welcome home, honey! What’s for dinner?” you know it’s time to work out some new household routines. It may be worth spending money outsourcing some household duties, or simply learning not to stress the small stuff. Parenting offers some extra challenges. Torabi advises stay-at-home dads with high-earning wives to work part-time or stay active in their industry, since there may come a time when they’ll want to go back to work (and the same holds true for moms). The working parents’ mantra should be “make it work” rather than “have it all.” Parenting always involves some compromise and sacrifice, regardless of who earns more.